Sharkoon is a company from Germany which claims, "We do not follow any trends – we set them". This is evident in their latest offering, the Silent Eagle case fan. 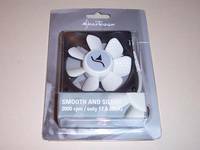 This is an 80mm fan, offered in two models, with the only difference being the speed... 1000RPM and 2000RPM. Usually case fans aren't anything to get excited over, but what sets this fan apart from other case fans is obvious just by looking at it. 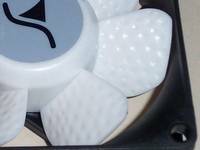 The fan blades are dimpled like a golf ball! Sharkoon claims this dimpling effect "helps to reduce air resistance and turbulence, resulting in particularly quiet operation while maximizing airflow volume". 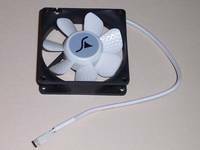 Will this increase the airflow and ultimately decrease the case temperature? In comparison with conventional fans the unique surface structure of the Silent Eagle allows an improved airflow - at the same rotation speed. This principle is based on the surface texture of a golf ball, which helps to reduce air resistance and turbulence, resulting in particularly quiet operation while maximizing airflow volume. In addition, the rounded edges of the Silent Eagle's frame offer a markedly improved air intake." 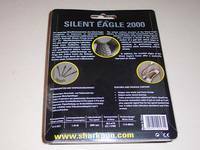 The Sharkoon Silent Eagle is packaged for a retail setting, providing you with ample information on this unique fan. The package is more than sufficient for shipping, and will not cause any damage to the unit or other included items. Removing the fan from the packaging, you can see what makes this a unique fan. There are a total of seven (7) fan blades, which may not be standard, but in itself doesn't make it unique. 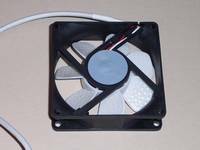 What is so unique about this fan is that the fan blades are not smooth, but rather are dimpled like you would find on the surface of a golf ball. Will these dimples increase the airflow and lower the case temperatures? We'll see. Sharkoon has wrapped the power cable in a rubberized fabric sheath. This allows good airflow, and keeps your case looking stylish. The rubberized fabric was helpful when placing the cable where I wanted it to go... Once I put the cable in place, it was more likely to remain in place. As you can see here, there are no LEDs on the fan. Here you can see a close up of the dimpled fan blades. Both sides of the blades are covered in these dimples. 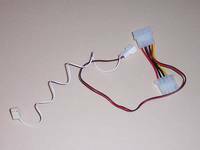 Sometimes you don't have an available 3-pin fan plug, so Sharkoon has included a 3-pin fan connector to 4-pin molex adapter (below left). They even made it so you can connect the fan to a separate fan controller if you need to use the molex adapter! The final things found in the package were a few little accessories (above right). There are the usual fan screws, and they also include five rubber push bolts. These are nice because it helps reduce vibration. 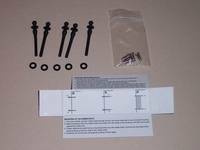 The packaging also doubles as installation instructions for the rubber bolts.